These perfectly proportioned sets each include a travel sized shampoo, a travel sized conditioner, and a sachet of the cult Elasticizer hair treatment. With no colour, no fragrance, and no parabens, the ultra gentle No Scent, No Colour collection is perfect for all hair types, even the most sensitive. The gorgeous Soft & Shiny gift set includes the Moisture Balancing Shampoo and Conditioner. These sets are on sale, but be quick – once they’re gone, they’re gone! This multi-purpose tin is a lifesaver. The intensely moisturising pure shea butter protects, nourishes and moisturises even the driest of skin. It can be used anywhere on the body, from elbows to toes to cheeks – it can even be used on the hair as a deep conditioning treats for parched locks. The absolute luxury of a Roger & Gallet soap doesn’t have to be limited to the bathroom! The accompanying Travel Box protects the plant-based bar when on the go, and acts as a stand to keep the soap away from standing water when washing. The sensual fragrance icon Jean Paul Gaultier Classique has been downsized for the summer. The new 20ml size is absolutely gorgeous – a petite little bodice filled with the familiar orange blossom-rose-vanilla scent. Slip into your hand luggage or your clutch on a night out for a hit of the incredible scent. If you’ve already got firm favourite products that you want to take with you but you can’t find a travel size, opt for this extremely handy kit from Mister Mascara. The large PVC bag contains 2 x 25ml screw top pots, 3 x 100ml bottles, a funnel, a spatula, and self-adhesive labels to tell the bottle apart. All of the bottle comply with EU liquids in hand luggage regulations, too! For perfect skin wherever you find yourself in the world, the brilliantly effective Clarisonic Mia is your perfect partner. The sonic technology of the handset works cleanser way down deep into the skin to lift out all of the dirt and make-up that accumulates in your pores. Plus, the handset comes in delectable candy colours! Ideal for weekend breaks or short-haul holidays when you're just taking hand luggage. 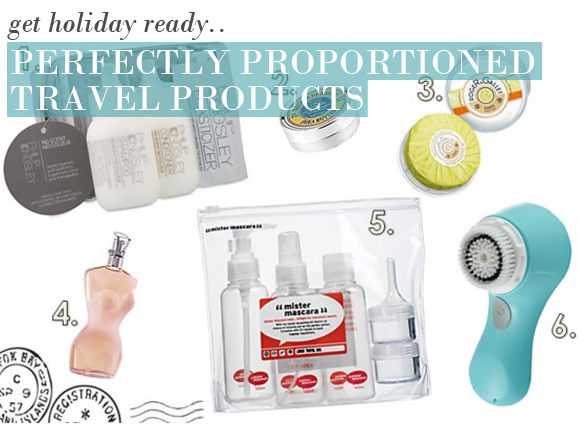 This kit meets all of the EU regulations for liquids and creams for carry-on luggage. So all you need to do is fill up the pots and bottles with your favourite products (using the handy funnel and spatula supplied) and you're ready to go. The bottle sizes are pretty generous too - so could easily last you a whole week. And they even provide a summary of the regulations, and labels to put on the bottles. So it's all you need for a worry free flight. This entry was posted on Thursday, July 7th, 2011 at 3:17 pm and is filed under Fragrance, Haircare, Skincare. You can follow any responses to this entry through the RSS 2.0 feed. You can skip to the end and leave a response. Pinging is currently not allowed.